Boil the water. In a large bowl pour the flour and make a well. Pour the boiling water by mixing with a spatula. Let cool a little before mixing with your hand to have a soft dough. Cover with a cloth and let stand for 15 minutes. Knead the dough a little and divide it into 6 equal pieces. Put the 50 g flour in a bowl. Make balls with the pieces of dough and pass them in the flour. Flatten the ball of dough on a floured surface. Flatten as thinly as possible and use a brush to apply a thin layer of oil over te flatten dough. In the middle of the dough put 50 g of cheese and fold the edges to close the cheese and form a rectangle. Flatten gently with the rolling pin to enclose the cheese. Do the same with the rest of the dough and cheese. Heat a pan. Spread some oil with the brush. Place a cheese farata on the hot pan and cook for a minute. With the brush, put some oil on the farata before turning it over. Cook for a minute and return the cheese farata again. 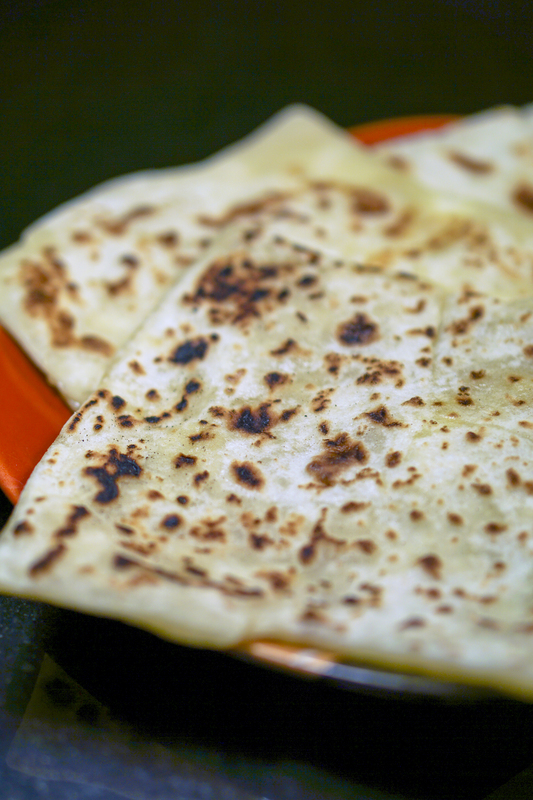 Once the cheese farata is golden on both sides it is ready. Put it on a plate and cover it with a cloth before cooking the next farata to keep it warm. Once all the cheese faratas are cooked enjoy hot with coconut chutney or a potato chutney.